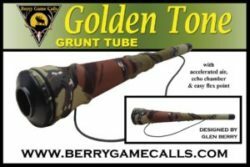 The Golden Tone Grunt Tube is a revolutionary design by Glen Berry. The flex point gives you the opportunity to easily access the call with little movement. The accelerated air helps produces those perfect tones, sounding like the real thing! The echo chamber gets that bottom end, guttural sound of a bull elk. 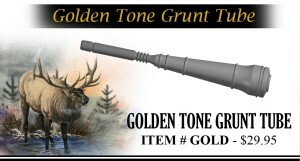 Sound like a World champion elk caller with the new Golden Tone Grunt Tube. Comes with Predator Green Deception tight stretch camo cover, and easy carry elastic lanyard. Size: 4 inches at Bell end and 1 inch at mouthpiece end 24 inches long.